This Taylor 5458 maximum/minimum temperature thermometer records the highest and lowest temperatures to be observed between the times that the unit is reset by magnet. The device is useful for checking whether a piece of refrigeration equipment is holding temperatures within the safe zone. 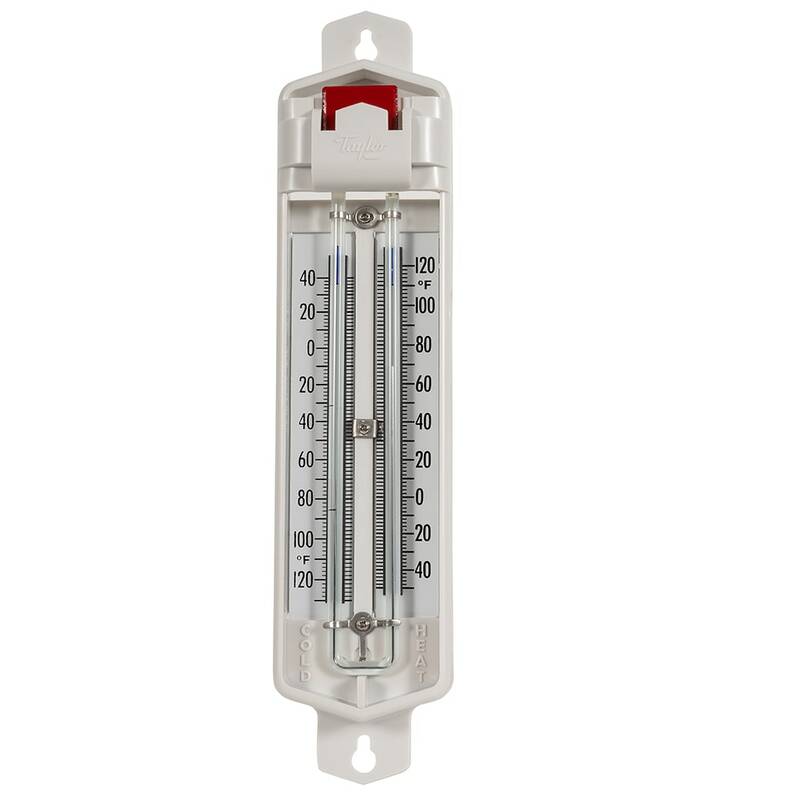 The thermometer is built in a rugged white plastic casing and filled with mercury. "Received thermometer with a "split" or "space" in both sides of the mercury column. Was able to "rejoin" the mercury on the "HEAT" side by dippi..."
"I ordered three min/max thermometers and one had a scale that was not even close to functional. The other two seemed like they would work OK but..."
"This is a great max/min thermometer." "Received thermometer with a "split" or "space" in both sides of the mercury column. Was able to "rejoin" the mercury on the "HEAT" side by dipping into boiling water having the mercury climb into the bulb. But, there remains a split or space in the mercury on the "COLD" side which renders the COLD side useless as I don't know how to resolve this problem." "I ordered three min/max thermometers and one had a scale that was not even close to functional. The other two seemed like they would work OK but I had to adjust the scales on both the min and max sides to make the thermometers even close to accurate. The glass tube of the one with the weird scale (it was Fahrenheit but was 3/4 of an inch shorter between the extremes than the other two) was knocked off the mount but fortunately didn't break. I contacted Katom via e-mail about returning the bad one but received no reply. I'll keep the other two." "Had a defective item, called you guys, no questions asked, you shipped out a new one pronto. GREAT SERVICE!!!" "I use it in my greenhouse. Fabulous! Great, solid construction. A great buy. Have recommended it to others.. - NR"
"Five star product and company service (but S/H was too expensive). It works beautifully!" "I was super happy to see these available from you guys!!! We use these throughout a large Nursery operation and find their reliability exceptional. I believe these thermos are priced cheaper than 24 years ago...STILL from the same producer...Thank You and CHEERS...it was -22F...your THERMO told me ..YIKES"
"Hard to find. thanks for the great service!" "This is replacing the same thermometer which is 30 years old. The only reason I am replacing it is the the temperature numbers have faded and they are barely readable"
"Thermometer works fine, max/min is easy to read, but there is no push button. Reset of the max/min sliders is via the small red magnet in the slot at the top. I've listed it as "would recommend to a friend," but only with the caveat that push-button functionality is not a requirement. For my application (inside a freezer, where horizontal is easier to do than vertical) that magnet tends to fall out of its storage slot. Fortunately, some of the racks are made from ferrous metal, so I just stick the magnet on one of them." "Perfect for localized and general use. Use for particular areas where I need to know the temperature extremes quickly accurately. These units last for years without calibration, drifting or batteries. Wonderful old school technology." I would absolutely buy this product again!!!! "I use the Taylor 5458 thermometer in my small greenhouse where it is very important to know high and low temperatures. It works great and it gives me great piece of mind." 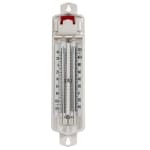 "My 85 year old Mother bought this to replace this exact thermometer! Now the Taylor 5458 has been something of a family heirloom for nearly 100 years. Believe it or not, the original is still going strong but the plastic has started to break and the numbers have faded over the years. Time for a new one! I'm not exactly sure of when this design first made its debut but it has stood the test of time. My Great Uncle was issued this thermometer by the national weather service sometime in the early 20th century. It has hung on the wall of my house since I can remember and I'm not nearly 60. Mom is so thrilled with the quality of this replacement that she is ordering four more for us kids! Do not be put off by the mercury separating during shipping. A few gentile taps on a hard surface and it all rejoins. There may have been a few very small lines in the mercury but this disappeared within 24 hours of use. Also, the internal metal high and low markers got stuck at the top of the glass and required a bit of persuasion with the magnet to pull down. None of these are a reason to turn away from the tradition and quality of this wonderful instrument! Bottom line: 1. It is as accurate as anything on the market. 2. It is time tested. 3. It is simple and easy to read (even for Mom who is legally blind) 4. It's a good price for the quality Buy it! You and your Mom will never regret it! :-)"
"I purchased my Taylor 5458 max/min thermometer to monitor the temperature. flucations in my green house. So far it is working well giving very accurate readings. When it arrived the Mercury had seperated in the column and had to be forced down By shaking it down. Otherwise this is the best max/min thermometer on the market today for the money." "I found this product to be very accurate when compared against my NIST calibrated lab thermometer. The only problem was the shipping process resulted in the mercury separating. It was easily reunited though just by quick downward thrusts."